Five clicks of the power button turns it on or off. Press the power button three times to use the basic settings. Press the + or - buttons to scroll through the coil setting options. 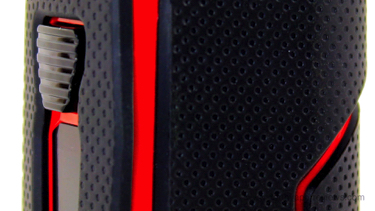 The wattage range is 1-80 watts and the temperature range is 200℉ - 600℉. Press and hold the + or - buttons together to lock or unlock the screen. The NotchCore Atomizer is a bottom airflow controlled, push open top filling, pyrex glass tank with a 2.5 milliliter e-liquid capacity. 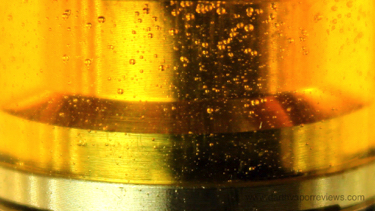 It features an interchangeable 510 drip tip. 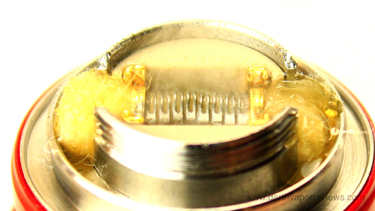 It is 510 threaded and has a Gold platted atomizer base designed for horizontal coils. It can be disassembled into five main parts for cleaning. * Very lightweight, pocket friendly design. 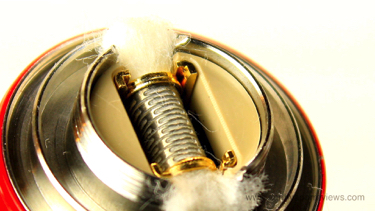 * Amazing coil design/ comes with 5 coils. * Easy one button design/tactile buttons. * Excellent flavor and vapor production. The Espion Silk with NotchCore Starter Kit is an 80 watt box mod coupled with a 2.5 milliliter tank. The kit comes in a sturdy cardboard box with a slide off sleeve. 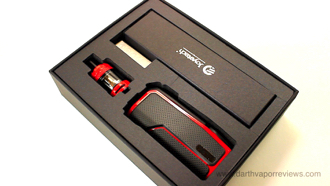 Inside the box, the kit contents include: an Espion Silk User manual, a NotchCore Atomizer Quick Start guide, a warranty card, a maintenance card, a USB charging cable, a 5-pack of 0.4 ohm NotchCoil coil heads, one comes pre-installed, a spare Pyrex Glass tube, spare parts, the NotchCore tank and the Espion Silk 80 watt box mod. The Espion Silk features a built-in 2800 mah battery, a rubber padded textured body, a spring-loaded 510 connection pin, a reset button on the bottom and an easy to use tactile power and plus and minus buttons. 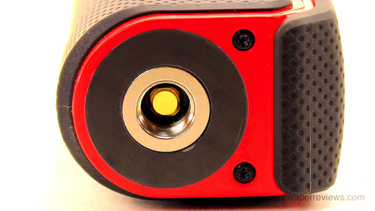 Charge the Espion Silk via the micro USB charging port located near the bottom of the mod. 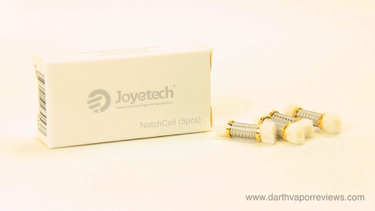 To use the NotchCore tank, insert the ends of the coil into the notches on the base. Prime the coil. 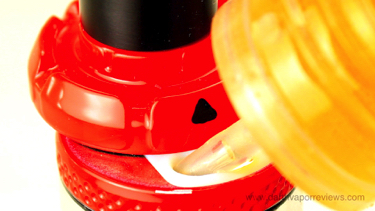 Add the glass tube and screw on the top cap. Push open the top and fill with e-liquid. Once full, close the cap. 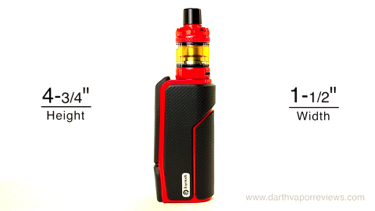 Together the Espion Silk and NotchCore tank are roughly 4-3/4" in height by 1-1/2" in width. I really enjoyed vaping with the Espion Silk. It's very comfortable to hold with the rubber pads although they are harder than I thought that they would be. Not to mention that you get five coils with the kit and you can replace the cotton wick making them last a lot longer. I hope to see more horizontal coil designs like these in the future. Personally, I don't use Puff Counters and this one times out too fast to see it. I would rather see the puff counter replaced with a digital clock. 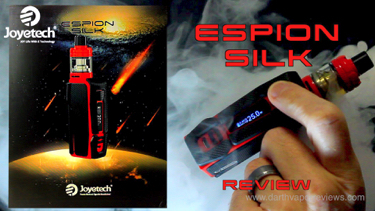 Overall, I really like the Espion Silk. It vapes great with the included NotchCore tank, but it's an 80 watt mod so you could use it with other tanks. The mod is very lightweight. Probably because it's made out of plastic. I do wish it matched the material and paint job of the NotchCore tank. The tactile buttons make it very easy to find the buttons without looking. I like the design of the push open fill ports as opposed to the twist off top caps to refill e-liquid. For me, the coils stole the show. I didn't know what to think at first, but they were easy to install and the flavor and vapor was excellent. The Joyetech Espion Silk with NotchCore Atomizer Tank Starter Kit currently runs anywhere in the $50-$100 range and comes in the colors of Orange, Black and Brown. * Puff Counter times out too fast to read. * Wished mod material matched NotchCore. * Like to see addition of digital clock.